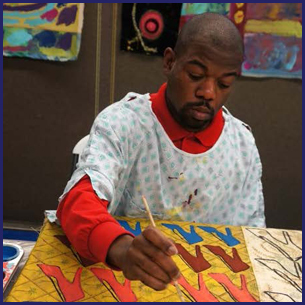 Berkeley Industries provides a safe and healthy environment for people with disabilities where they can develop the vocational, social and interpersonal skills to lead more independent and productive lives. Berkeley Industries accepts contract work from private industries including small assembly, disassembly, salvage, recycling, packaging and all aspects of mailing. Between 100 and 140 workers earn wages based on the U.S. Department of Labor (DOL) regulations for sheltered workshops. Coaches develop hiring opportunities for people with disabilities at local businesses. Job coaches work closely with new employees on a one-to-one basis to teach them the skills necessary to perform and maintain their jobs. As the employee becomes comfortable with his or her duties, the job coach gradually fades out of the workplace. 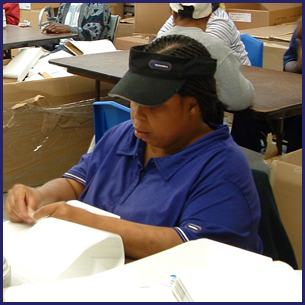 We provide supervision, training and transportation to people with disabilities at local business job sites where they work alongside people with and without disabilities, performing tasks such as assembly-line production or janitorial services. Learn more about Berkeley Industries. Unique Art by Special People is a program that fosters creativity, self expression and community engagement. Learn more about Creative Works Studio.